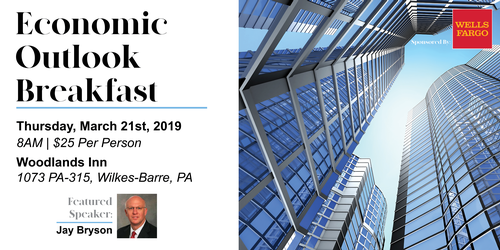 The Greater Wilkes-Barre Chamber of Commerce, in partnership with the Greater Scranton Chamber of Commerce, will host the 2019 Economic Outlook Breakfast at The Woodlands Inn on March 21 at 8 AM. Jay Bryson, Ph.D., a global economist with Wells Fargo is this year's featured speaker. Based in Charlotte, North Carolina, Dr. Bryson has published in various academic and economic journals. His comments on the economy regularly appear in the Wall Street Journal, the New York Times, and USA Today. He also makes frequent appearances on CNBC and Bloomberg TV.